About a two hour drive from Madison, the Bristol Faire is a great day of renaissance fun for the whole family. Unlike a lot of renaissance faires, there's lots of trees and shade. You can go in street clothes, or dress up in costume, as you like. 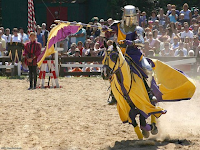 Kids can enjoy a variety of rides and treats, grownups can enjoy a wide variety of shopping, and everyone can enjoy a bunch of open air performances, shows, and jousts. Wear good shoes, the faire is BIG, and there's a lot of walking to be done. Bring an all terrain stroller for the wee ones, and sunblock for everybody. Use a two-for-one coupon from a Bucky Book, and catch it on a kids' free day, and you can save quite a bit of money on admission. The faire is seasonal, open on weekends during the summer, so check the website for the schedule.